We read Surah Fatihah aloud altogether, then sisters individually read aloud a few letters/words, ayahs (according to her ability and with the help and encouragement of her fellow sisters). We read Surah At-Tawba from Ayah 100 to Ayah 111. In sha Allah, this will be an ongoing part of our Halaqa and one day in sha Allah, we will have Khatam Quran and begin again. Sisters shared reading and discussed the translation of the approximate meaning. Sister Megan led a dua for Sister M and family. In sha Allah, our next Halaqa will be on Thursday May 11th, at our Headquarters. Sister Megan informed us of a new Book Club starting up. I wanted to extend an invitation to a book club that a friend of mine has started, inshAllah. The goal of the group is to encourage each other to keep seeking knowledge, and having discussions. We also want to invite non muslims or people who are interested in Islam to learn more about Islam with us inshallah. Starting out, we will be reading "The Bible, The Qu'ran and Science". We will be meeting once a month to discuss. The first meeting will be on Wednesday May 17th at 10am. We will be meeting at Eastern Stars Centre in Mississauga (5777 Cooper's Ave). If you are interested in joining us, or have any questions, please feel free to contact me on this email address meganmbarclay@gmail.com. Please let me know if you're interested so we can keep you updated on any changes. Look forward to seeing you there, inshAllah! neither endorsed nor denied they cannot be used for making Islamic Laws and Rulings. Daily Deen Doses. To join our group, send us an email. 6 . بلاش تركز مع أى حاجة ممكن تضايقك " كبر دماغك "
7 . افتح موبايك و اكتب " Nice Day "
17. حب نفسك و قول لنفسك " أنا بحبنى "
19. امسك ورقة و قلم و ارسم أى حاجة حتى لو شخبطة " خرج احساسك"
24. تصدق " أى مبلغ ، بسمة على وش طفل ، اتبرع بالدم "
26. لو حد زعلان منك كلمه و قولوه أنا أسف " و الكاظمين الغيظ و العافيين عن الناس "
29. ركعتين قيام و وتر " اوتر "
31. وردَك من القرآن اقرأه فـ أى وقت بس اوعى تنساه " 10 آيات على الأقل"
We read Surah Fatihah aloud altogether, then sisters individually read aloud a few letters/words, ayahs (according to her ability and with the help and encouragement of her fellow sisters). We read Surah At-Tawba from Ayah 73 to Ayah 99. In sha Allah, this will be an ongoing part of our Halaqa and one day in sha Allah, we will have Khatam Quran and begin again. In sha Allah, our next Halaqa will be on April 20th at Sister Sara’s home. Bits and Pieces can combine to form beautiful things. Your life is full of bits and pieces that beautify your life. 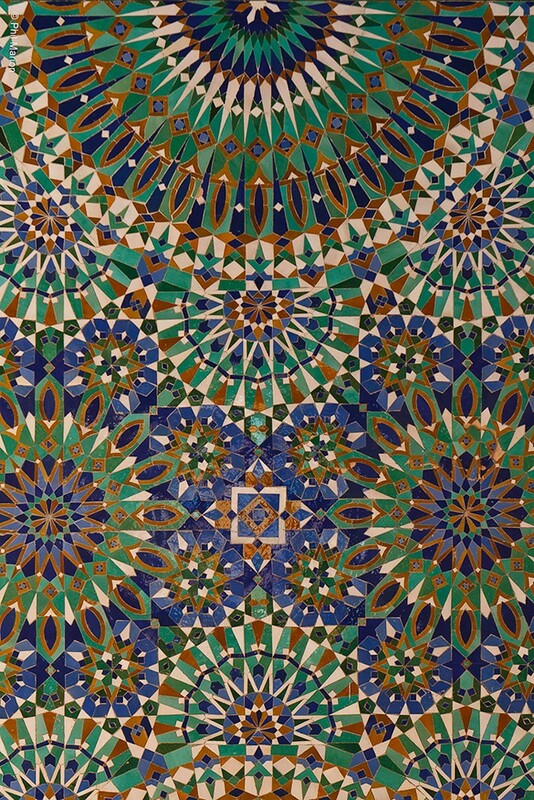 A google search of this image suggests that it might be from Hassan II Mosque, Morroco. in sha Allah, we will upload it here).